The solution to Quebec's self-inflicted paperwork, according to the Scheer Conservatives, is to put the job of tax collection into one set of hands – in Quebec City. Here’s a tip for Andrew Scheer, the rookie leader of the Conservative Party of Canada: Just because the Liberals say no to a demand from Quebec, that doesn’t mean you should say yes. A case in point is the Conservatives’ effort to turn Quebec’s perennial desire to collect federal taxes inside its borders into an election issue. The Trudeau government has repeatedly turned down the idea, so the Tories, sensing an opening, are going all in on it. 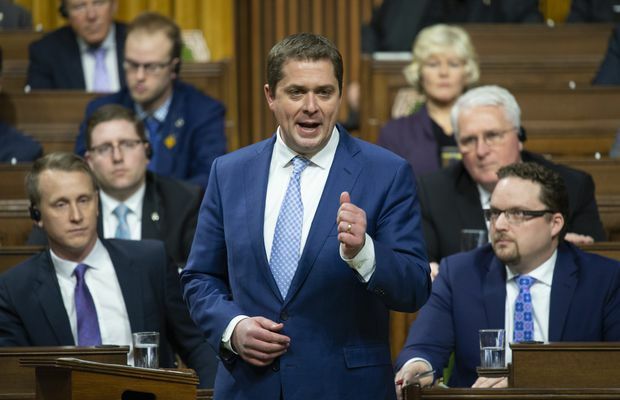 “The Prime Minister has slapped Quebeckers in the face by closing the door on this proposal to simplify their lives by having to fill out a single tax form,” Alain Rayes, a Conservative MP from Quebec, said Tuesday during Question Period. An MP for the separatist Bloc Québécois could not have overstated it any better. Which raises the question: Why are the Conservatives, a federal party, parroting the grievances of Quebec nationalists and failing to defend the turf of the level of government they one day hope to lead? Transferring Ottawa’s tax-collection role to Quebec is not in Ottawa’s interest, or Canada’s. It’s why previous federal governments, of whatever party, rejected the idea. While advocating for it might play well in a few Quebec ridings, it is out-of-touch with the nine provinces and the three territories that have harmonized their tax codes with Ottawa’s and rely on the Canada Revenue Agency to collect their due. Quebec remains the only province that collects its own provincial taxes – a role it jealously protects as a symbol of its unique status. There has been an unintended consequence, though: Quebec taxpayers are forced to fill out two separate tax forms every year, one provincial and one federal, with all the duplication of effort and annoyance that that implies. Somehow, this self-inflicted paperwork is now the fault of the federal government, and its perpetuation by Ottawa is a slap in the face of Quebeckers. The solution, according to the Scheer Conservatives, is to put the job of tax collection into one set of hands – in Quebec City. The more practical solution – Quebec City outsources tax collection to the CRA, just like the rest of the country – is a non-starter in Quebec, where it would be seen as an unacceptable concession. The most honest assessment of the standoff is to admit that the status quo is never going to change. Quebec has intractable political reasons for never handing its tax-collection powers over to Ottawa, and Ottawa is in a similar boat going in the opposite direction. Has Mr. Scheer thought about how he would respond as prime minister if, having given Quebec the power to collect federal taxes, another province demanded equal treatment? In a country where provincial grievances can escalate quickly, that’s a scenario that can’t be dismissed. And has Mr. Scheer pondered how it will be received in, say, Alberta, when he tells voters there he wants Quebec to collect federal income taxes and store the revenues in its coffers, to be remitted at a later date? Voters outside Quebec might be a bit twitchy about that. Then, there is the problem that Ottawa and Quebec not only have separate tax-collection agencies, they also have different tax codes. Parts of the two codes have been harmonized, but there are many disparities – the biggest being that they contain different definitions of taxable income. In order to simplify Quebeckers’ lives, Ottawa and Quebec would have to agree on what income is taxable, and what isn’t. But in negotiating a new definition, Ottawa’s might change, and that would affect the other provinces’ codes, which are all aligned with the federal government. There would be a complicated domino effect that could stir up old animosities. Mr. Scheer and his party have dismissed this concern, along with worries that thousands of CRA employees in Quebec would lose their jobs if Ottawa handed its tax-collection role over to the province. The Tories say these complications can be sorted out through negotiation. That’s wishful thinking. The Tories would be wise to backtrack and leave this issue alone. By falling into the easy trap of pandering to a minor and entirely symbolic Quebec government grievance that few actual voters care about, Mr. Scheer has put himself in a position where, if elected prime minister, he will be committed to delivering something that is probably impossible, and certainly undesirable. Sometimes “no” is the right answer, even in politics.